You were born into a family that loves to travel. We aren’t high adventurers. We aren’t constantly on the road. But we love to go see new things and experience new places. You might not know this because you were a horrible sleeper for the first year of your life so we didn’t have the energy to do much beyond drink coffee and eat M&Ms and go to Target. You still aren’t exactly a champion sleeper. 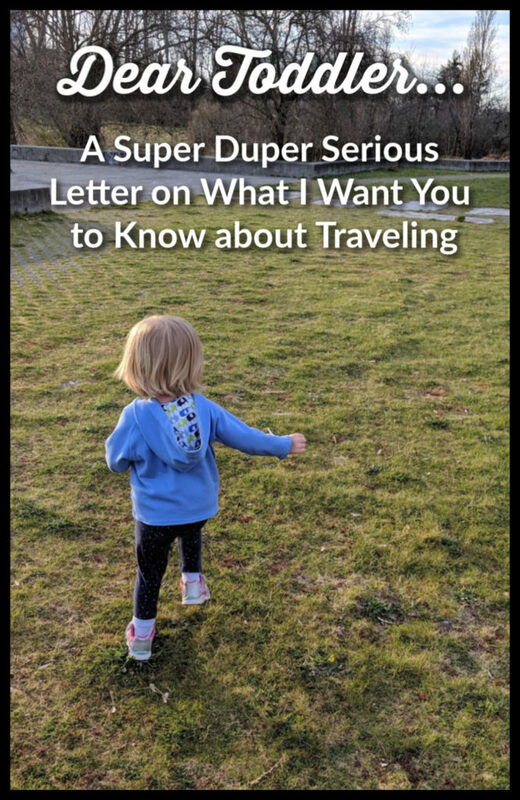 I hear other travelers talk about kids napping in their car seats or in carriers or in their mother’s arms in random places. Yeah, you don’t do any of those things. So we have had to sit back and ponder how to go forth in a way that works for us, but also for you. We like it when you sleep because that means we aren’t running on fumes and spending lots of money to take naps in hotel rooms. You could, you know, consider napping on the go. I’m open to it. I understand that traveling isn’t always what you want to do. I know sitting in a car seat for hours on end is super boring no matter how many Cheerios or new toys we give you. I know getting on a plane for the first time is probably a little bit scary with all the new sounds and sights and strange people all around us. And I know that when we go new places, you’re not always sure what the fuss is about. You love familiar things and routine and your crib instead of that weird hotel bed. And yet, we’re going to travel with you. We won’t do it every day, we promise. We don’t even go somewhere new every month (although, if we ever win the lottery, we might just do that and then I’ll write a new letter with some of this slightly revised). I want you to know that when we travel, I’ll try to make as many things familiar to you as I can. I’ll bring along some of your favorite foods…but maybe you could consider trying just a bite of some delicious pasta? Or maybe some roasted chicken with veggies that I ordered just because I thought there was some smidgen of a chance you might try it? It’s kind of like the chicken you eat at the Mexican restaurant we all like. No? It’s a slightly different color so it must be a completely different food that you can’t trust at all? Absolutely not? Only pouches? Okay. Fine. Whatever. We’ll work on that. I want you to know that when we travel, I will put my phone down and experience these new things with you. I will save all of those amazing pictures of stunning waterfalls and interesting landscapes and gorgeous sunsets to post on my Instagram later. Like when I’m in the bathroom since that’s usually the only time I can have my phone out without you thinking it’s time for you to play with my phone. Just a side note, it’s NEVER time for you to play with my phone. You’re a year and a half old. You don’t get a phone yet. But even though I have a phone that I enjoy very much, I do promise I’ll put it away. When we travel, that time is for us as a family. Traveling time is way more expensive than our time at home so it’s important time that we all must cherish and savor. I want you to know that when we travel, you’re safe. You’re going to see and hear and experience a lot of new things. Some of them you probably won’t like, but we will be right there to keep you safe and sound. 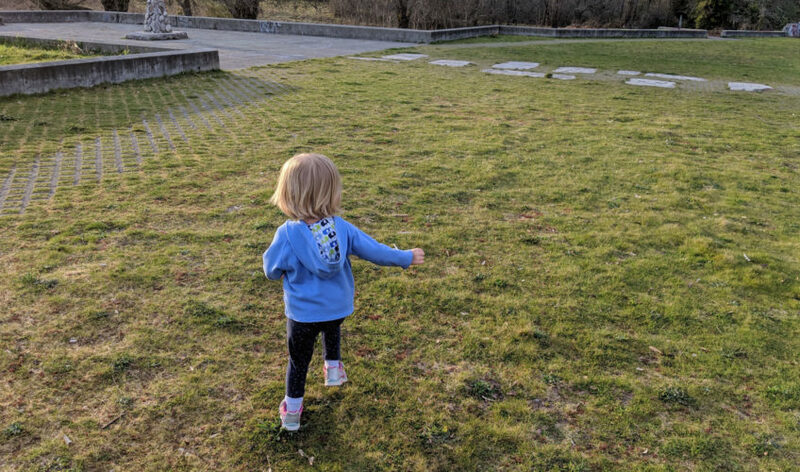 At least, so long as you stop trying to ditch us so you can run through any open spaces you see or straight for the nearest machine filled with bouncy balls. Pro tip, you need two quarters to get one of those out of there and I’m not even sure when the last time I carried change was. I want you to know that when we travel, we’re not just thinking about ourselves anymore. We’re thinking a lot about you. Our ideal vacation is going places where we can walk around and explore for hours on end, pretty much all day, every day. We aren’t the kinds of travelers who like to sit by the pool and relax. And yet for you, we’re changing. 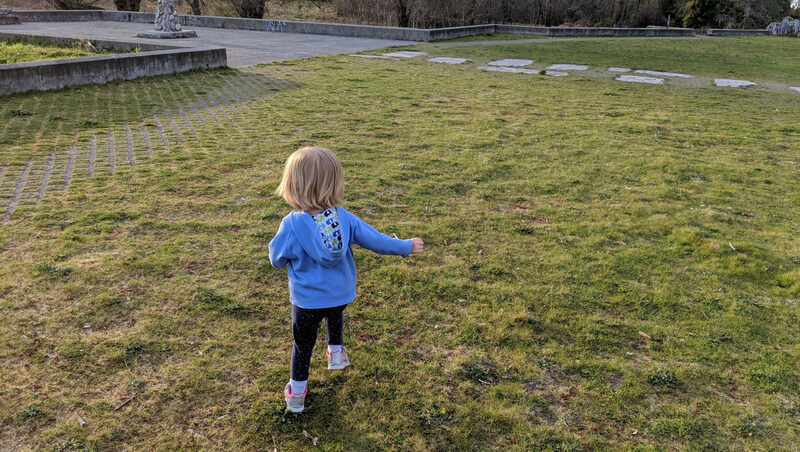 You also want to explore all day, but your little feet do get tired (…eventually) and you don’t tend to travel in straight lines. You need wide open places to wander around. So instead of cities filled with museums and restaurants that don’t serve Dino nuggets, we’re refining our ideal travel destinations. Beaches, lodges with expansive green lawns to explore, state parks…we’re redefining our idea of a vacation so we can all be happy. Plus, we want you to have that space to explore. Someday, we hope you love museums and cities and strange new foods as much as we do. For now, we want to help you just learn to love new places as much as we do.